Sun., Oct. 7, 2018, 9:46 p.m. In 2006, Spokane County’s recycling system recycled 68,374 pounds of paper, 108,643 pounds of metal, and 1,778 pounds of plastic. The recycling amounted to 42 percent of all of Spokane’s waste collected at the curb. But last year, it’s unclear how much was recycled. That’s because the city’s once-meticulous tracking of recycled materials has gone away under the single-stream system, and the company that sorts it all in a facility on the West Plains declines to make the information public. What happens to your old newspapers, cans and plastic bottles after they go in the blue bin? Washington mostly lets local governments determine how much to track about their recycling, and the information often is kept secret. That’s in contrast to Oregon, which has more stringent reporting requirements. “Oregon has a layer of oversight that we don’t have,” said Alli Kingfisher, statewide recycling coordinator for the Washington Department of Ecology. What it means for Washington is the state can’t track how collection companies like Waste Management distribute paper, plastic and metal after the material is sorted at its facilities. In Seattle, which has created rules requiring more disclosures to the public about recycling activities, a collections company acknowledged dumping “hundreds of tons” of damp recycled paper into a landfill, according to an article from the Seattle Times. The local branch of Waste Management said it has not had to dump any paper in the landfill since China stopped buying paper from the U.S. They haven’t needed to ship paper to China for a couple of years, said Steven Gimple, spokesperson for Waste Management. Marlene Feist, spokesperson for the city of Spokane, said the city doesn’t track the path of Waste Management’s recycling. 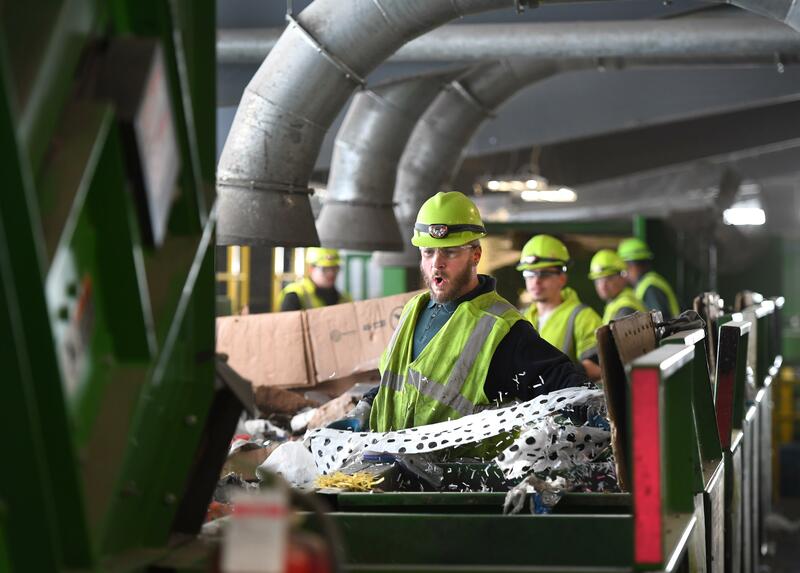 Waste Management won’t say where it ships its recycling, but Gimpel said most plastics go to Canada, metals go to the Midwest and the paper stays in the Northwest, generally. “We need to keep that information close to the vest in the interest of our customer base,” said Jackie Lang, spokesperson for Waste Management. Gimpel said about 6 percent of what people put in the recycling bin is burned in the Waste-to-Energy Plant in Spokane. But that doesn’t account for the missorted material that is shipped out as the wrong product and eventually discarded after it makes it’s way to recycling processors. Kingfisher said she would like to see more transparency in what collections companies do with their post-recycled materials. “It’s something that city and county governments should ask when they enter contracts,” she said. Haulers in Oregon must ask for permission to dispose of their paper. They have to say how many tons, where they’re sending it and give assurance that they have tried to get rid of it by other means. No glass in Spokane is recycled, but for good reason, said Waste Management and city officials. There isn’t a processing plant close enough to Spokane to justify the costs of transportation. But in the landfill, the glass has some use as an “alternative daily cover” to spread on the garbage in place of gravel that would otherwise be mined and transported to the landfills. Peter Spendelow, waste reduction specialist at Oregon Department of Environmental Quality, said Oregon’s laws for recycling are meant to make the state more environmentally friendly by using less oil and cut down fewer trees. Oregon saw 4 percent, or 12,131 tons, of recycled material disposed from September 2017 to the end of July 2018. “I think it’s horrible that these things end up being disposed,” he said. But he said he’s not sure how Oregon stacks up to other states. “I don’t have other states to compare it to,” he said. “(Oregon) jumped on this right away. But the caveat is that if the recyclable material isn’t economically feasible to collect and dispose of, then it doesn’t fall under that definition of recycled material, he said. Factoring into that cost is how much contamination is left in the sorted recycling, which is too much, according to industry professionals. Recycling that’s too contaminated is considered trash and isn’t tracked as well. Oregon is looking into the possibility of separating paper from the single-stream and making a dual-stream system. Spendelow said that Oregon is still looking into becoming even more transparent with its recycling. Once the state realized that China was reversing its policy – the worst-case scenario, as he put it – transparency became more important, he said. “If you’re going to go out there and collect, and then it’s discovered it’s disposed of after the fact, it’s going to be a huge credibility hit,” he said. On an annual basis, Oregon collects that recycling information, but it holds it confidential to protect the interests of the private companies. “It gives us an idea what’s going on and where we should focus our energies. We really needed to be transparent,” Spendelow said. Published: Oct. 7, 2018, 9:46 p.m.